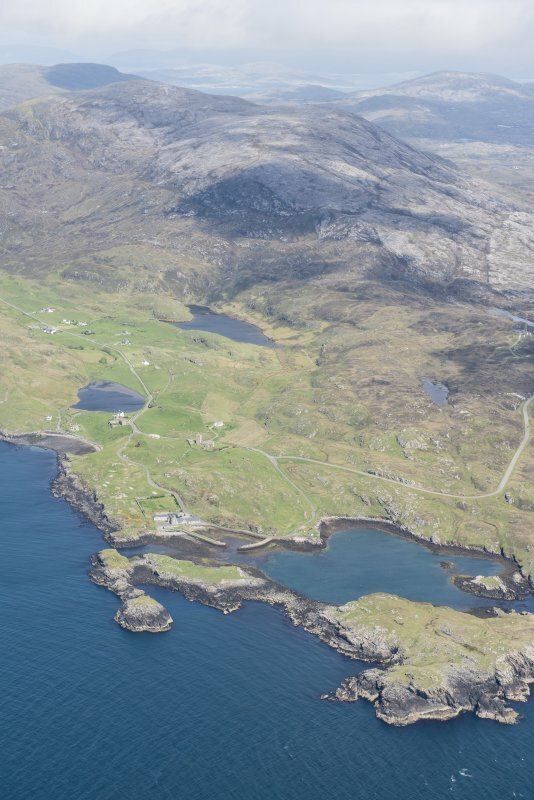 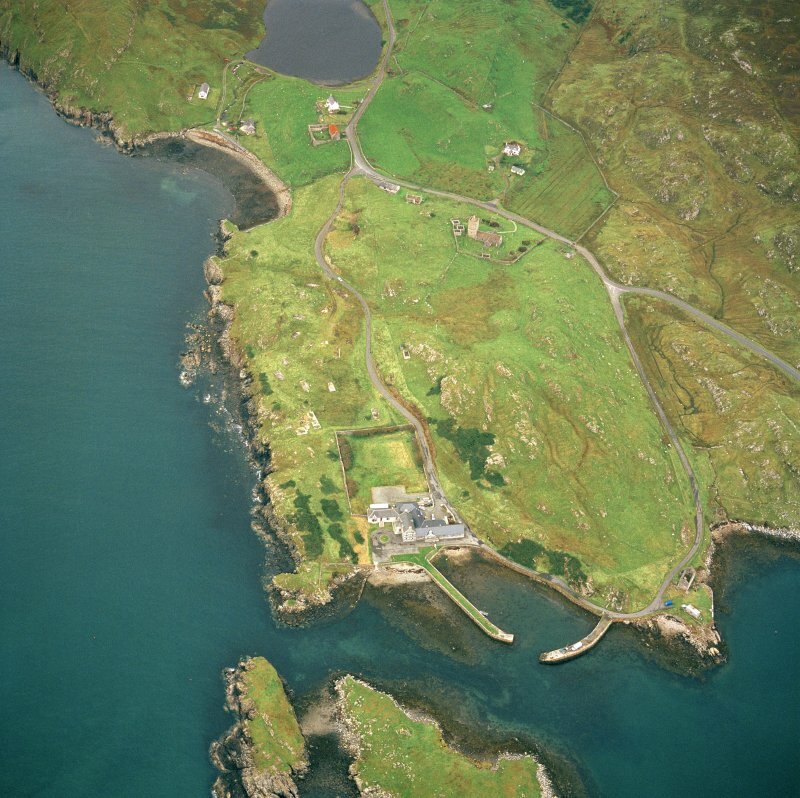 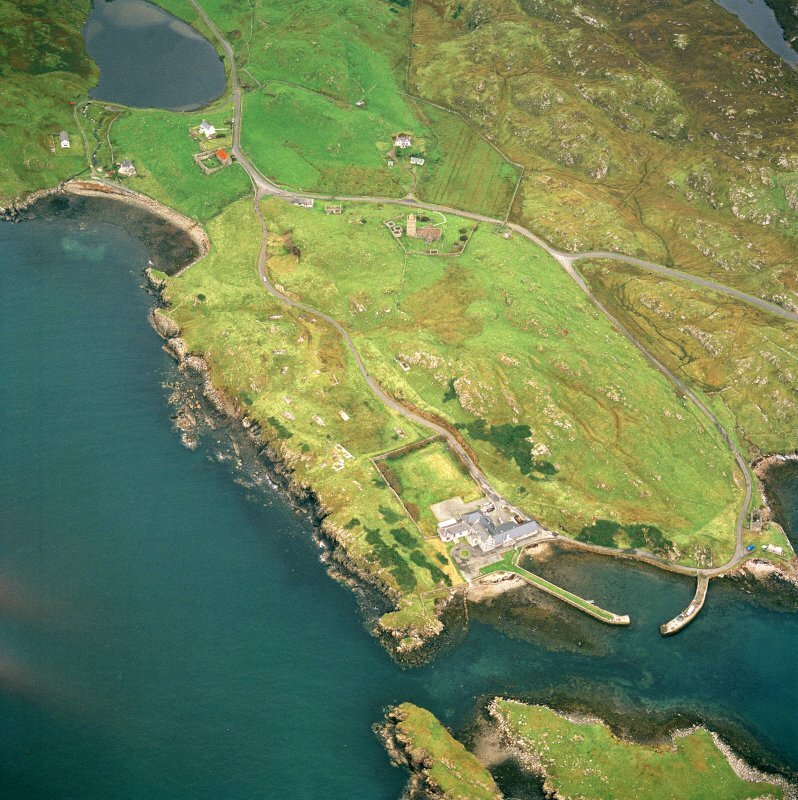 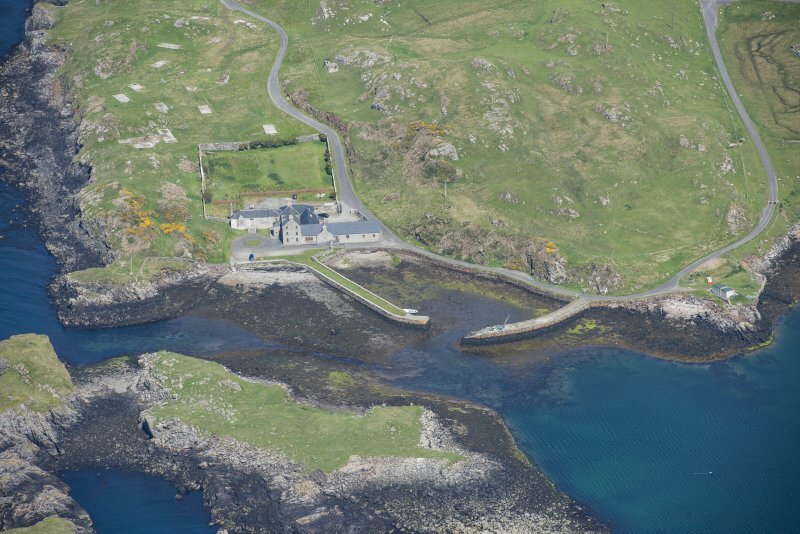 Oblique aerial view centred on the hotel and remains of the military camp with the church and burial ground adjacent, taken from the S.
General oblique aerial view of the remains of the township of Rodel and the nearby remains of nausts, elnclosures, a head dyke and lazy beds, Harris, taken from the W.
Oblique aerial view centred on the hotel and remains of the military camp with the church and burial ground adjacent, taken from the SSE. 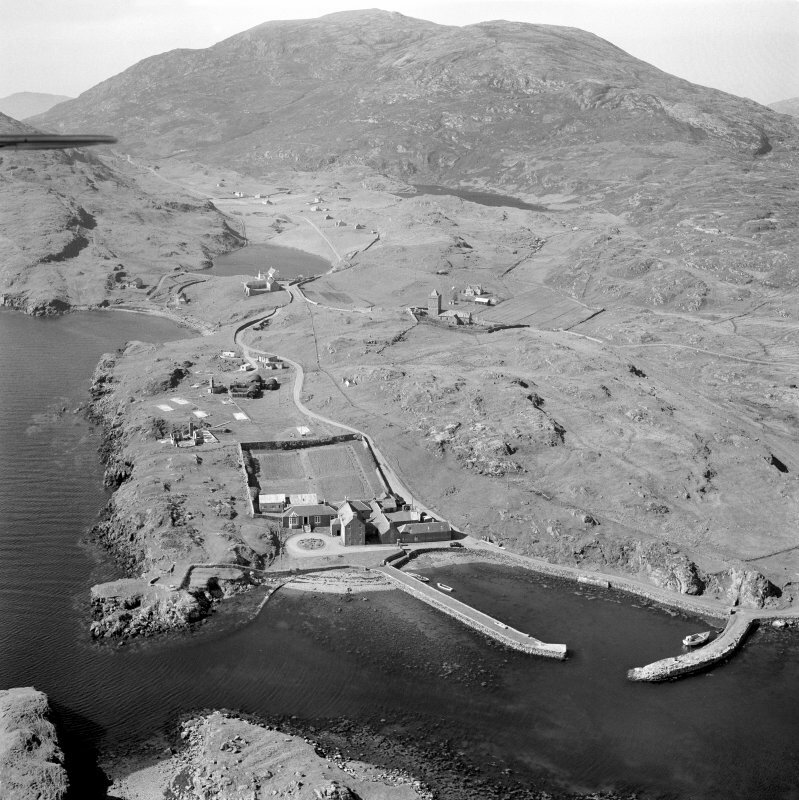 General view of Rodel Harbour, Harris, from east. 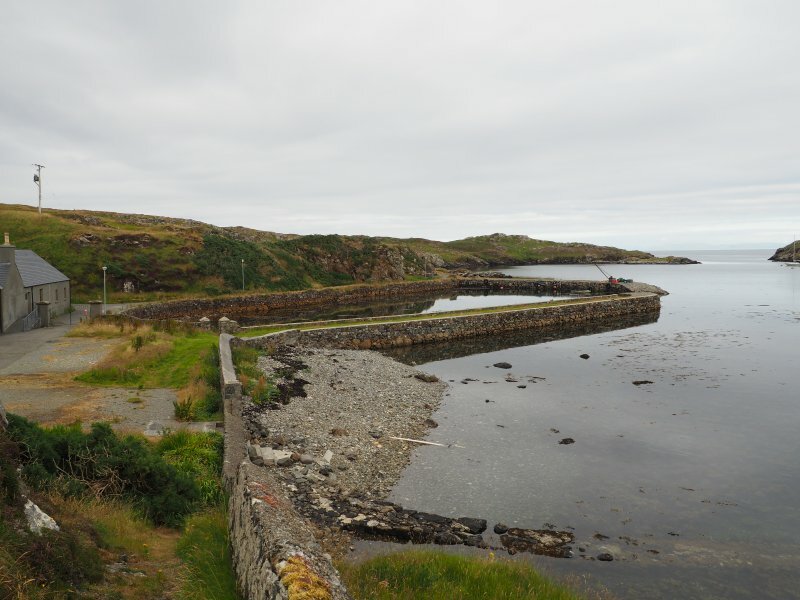 Location view of Rodel Harbour, Harris, from west-south-west. 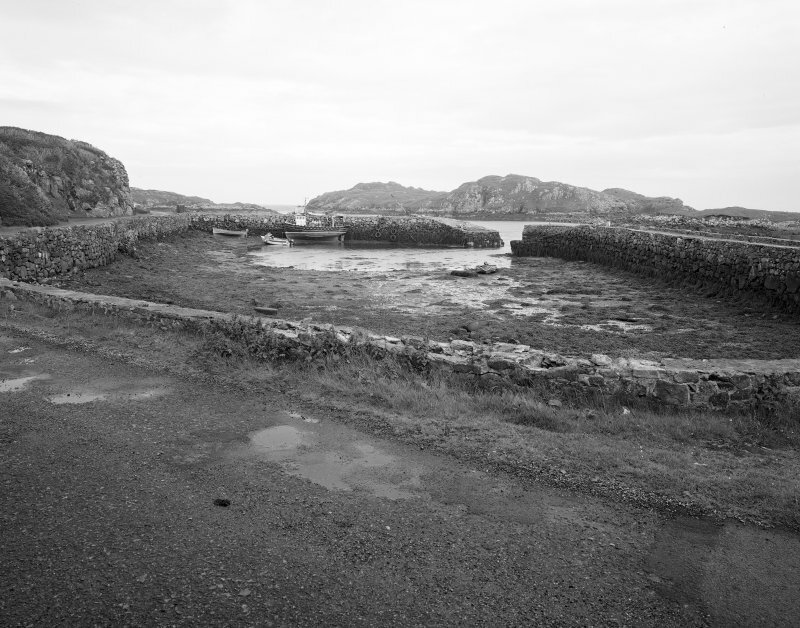 View of entrance to Rodel Harbour, Harris, from east. 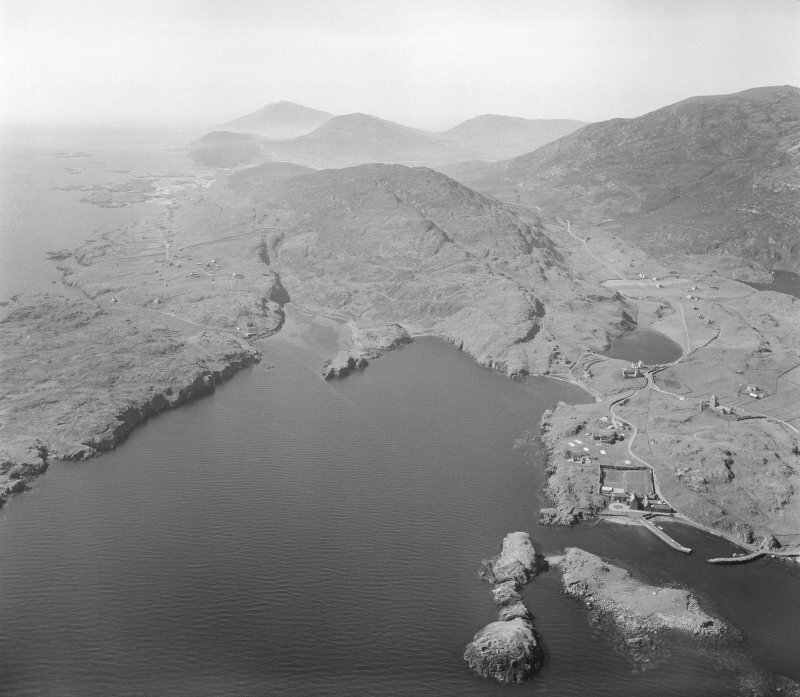 General view of Rodel Harbour, Harris, from north-west. 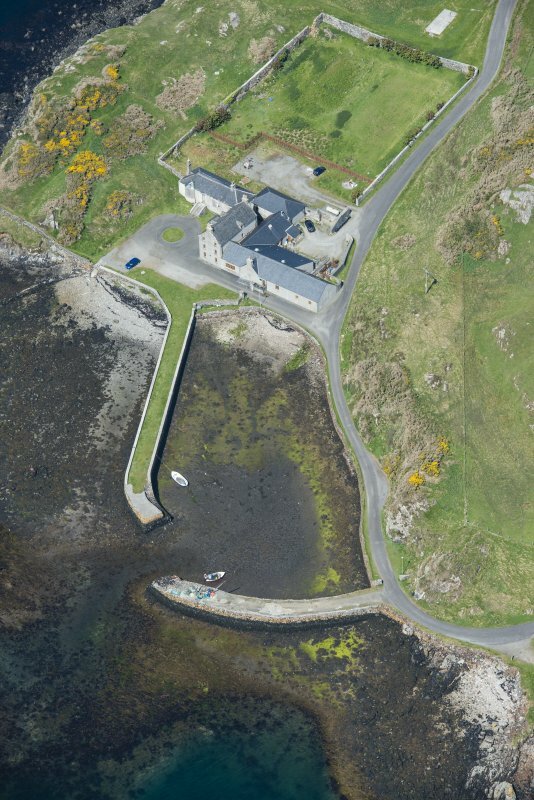 Oblique aerial view centred on the hotel and remains of the military camp with the church and burial ground adjacent, taken from the WSW. 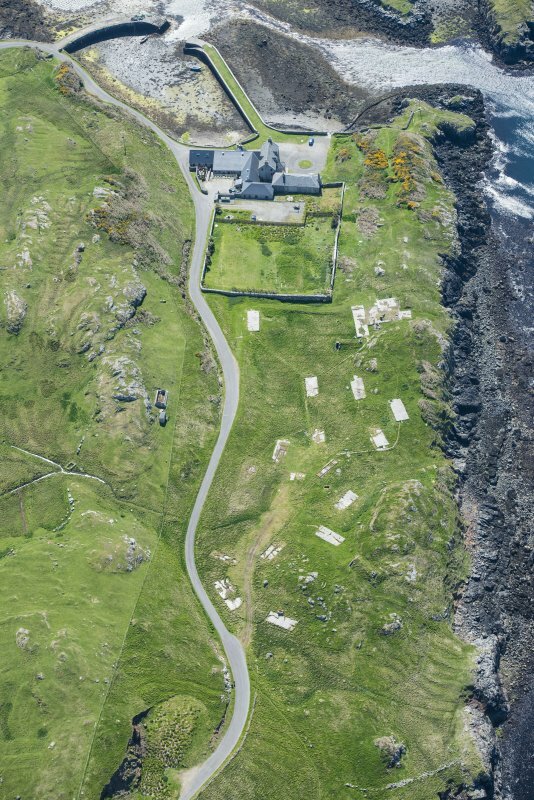 Oblique aerial view centred on the church and burial ground with the hotel and remains of the military camp adjacent, taken from the NNE. 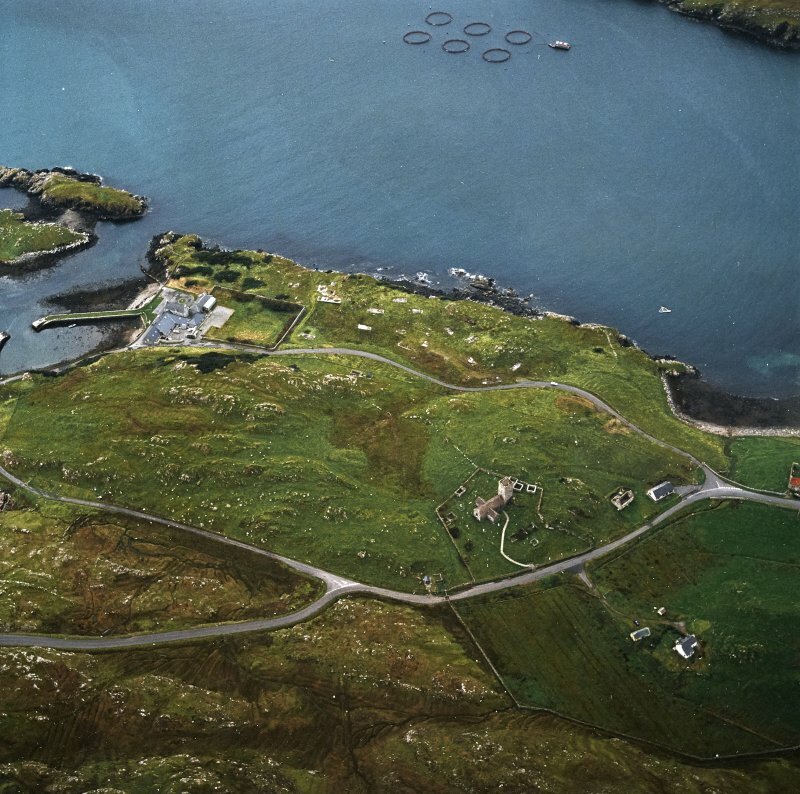 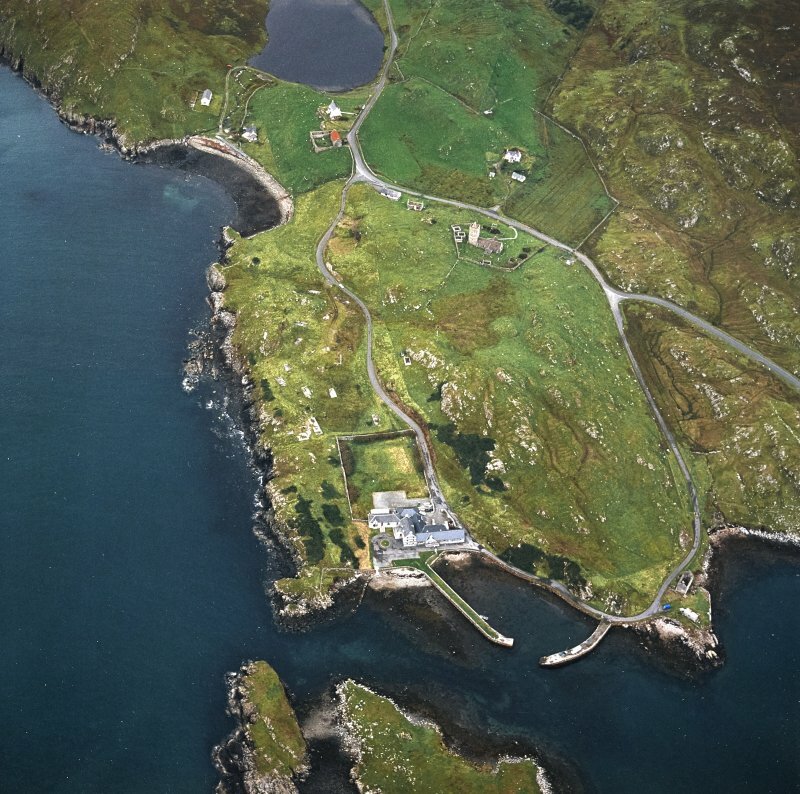 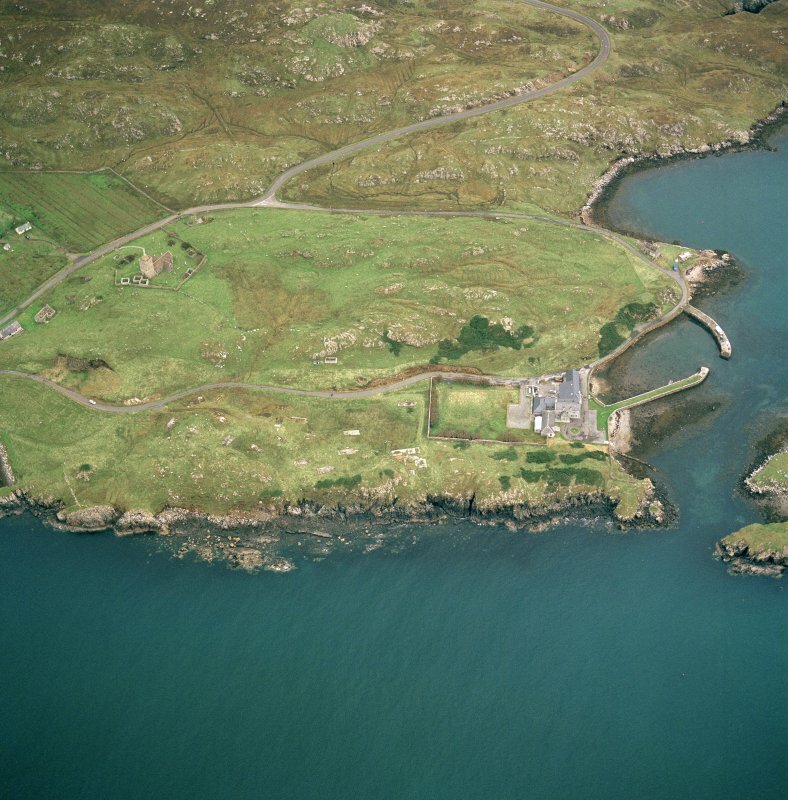 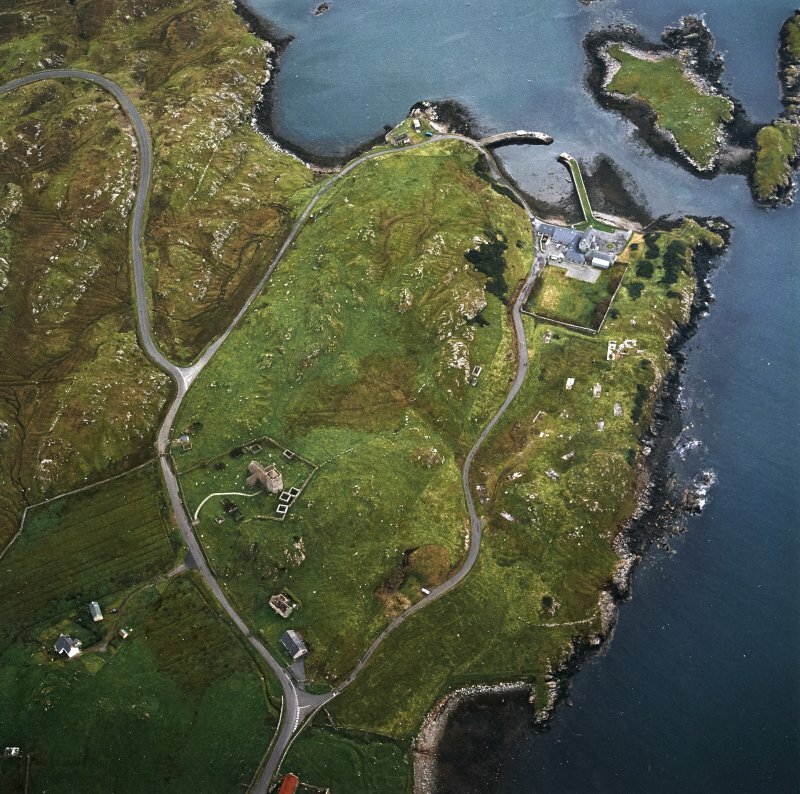 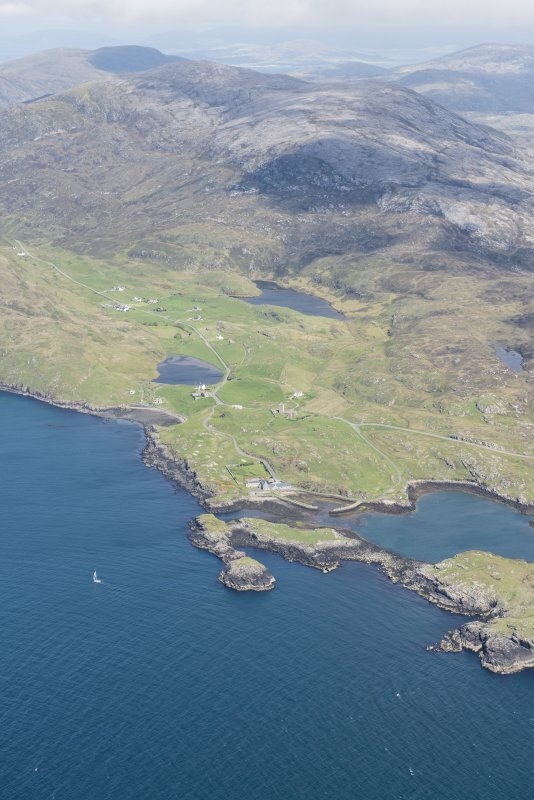 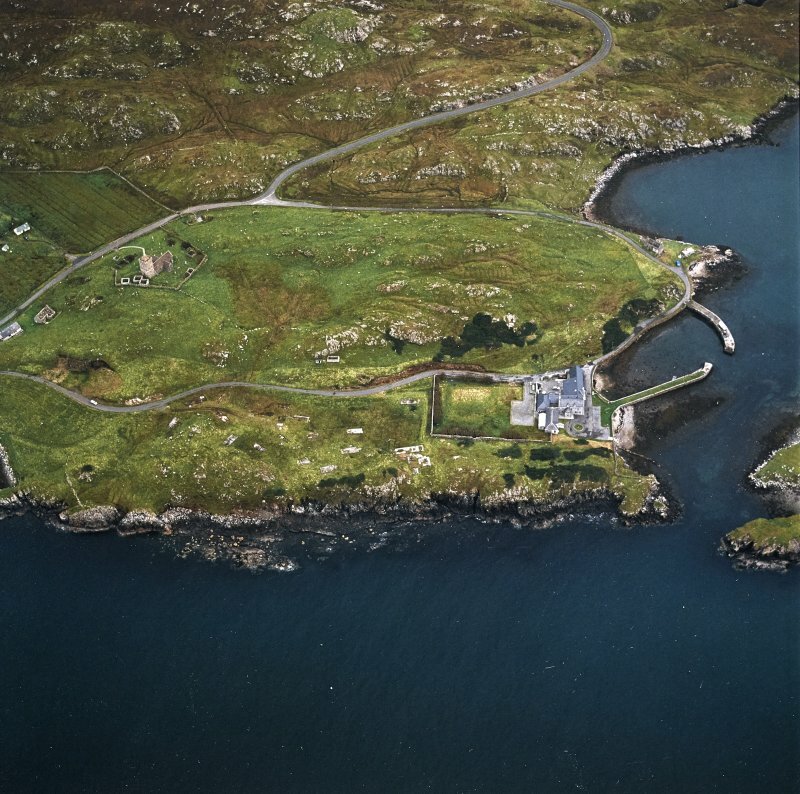 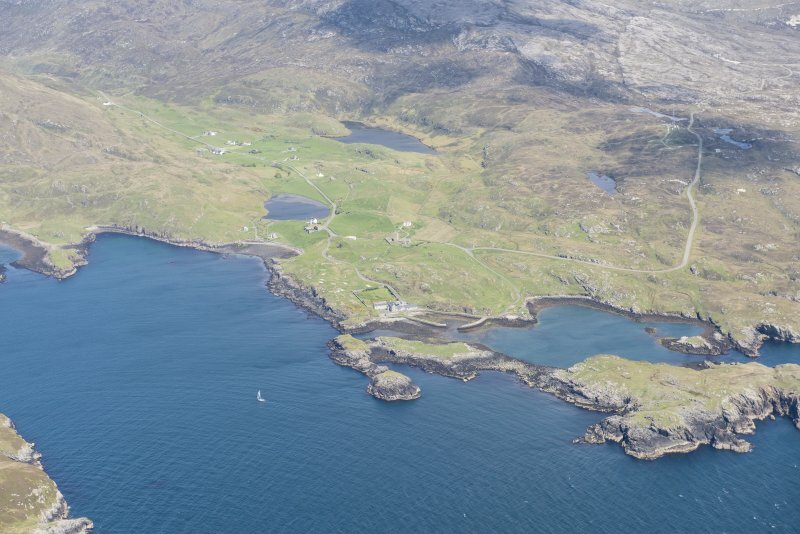 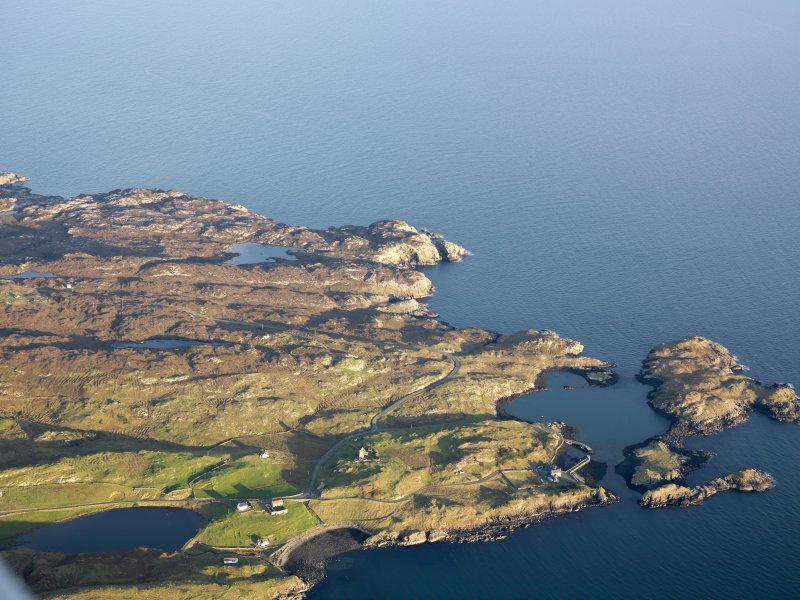 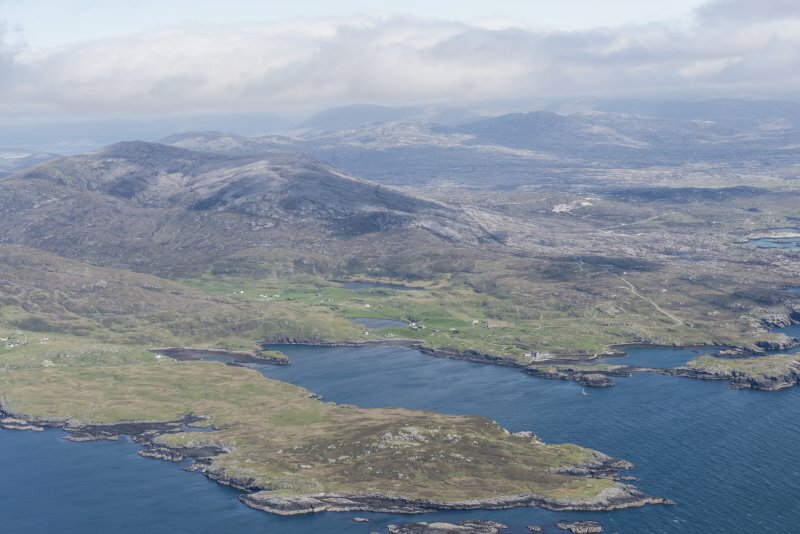 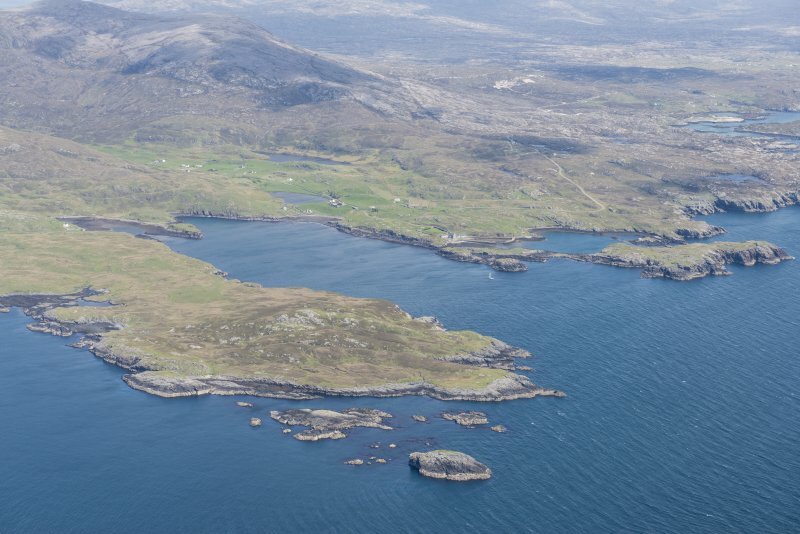 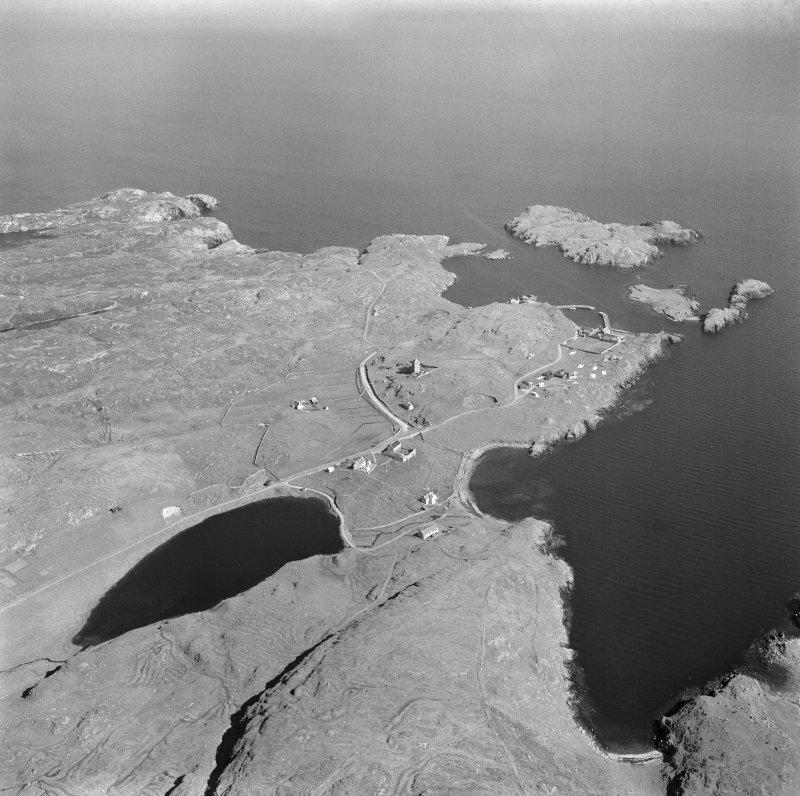 Oblique aerial view of Rodel, Harris, showing a distant view of St Clement's Church. 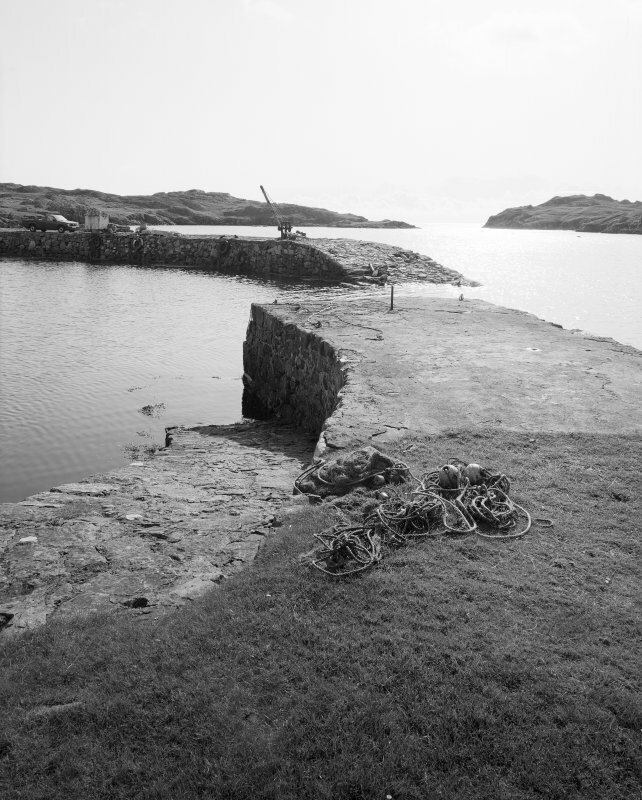 View from E of pier ends and hand crane. 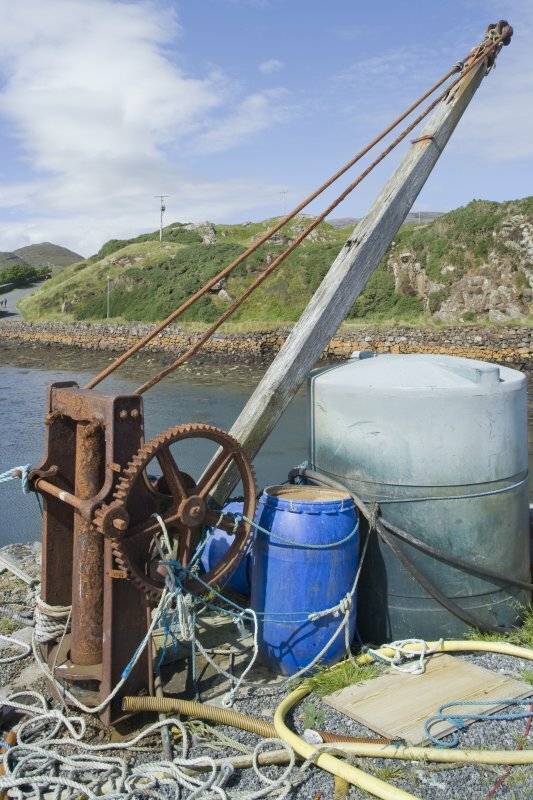 Detail of harbour crane on east wall of Rodel Harbour, Harris. 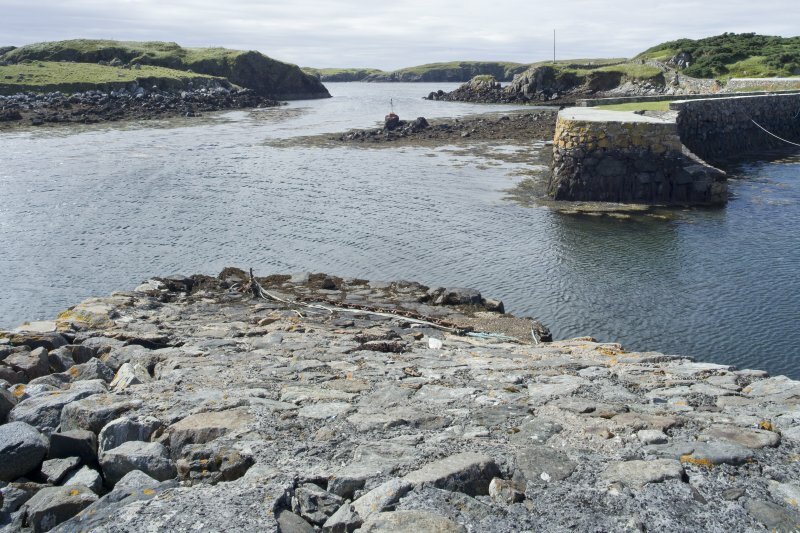 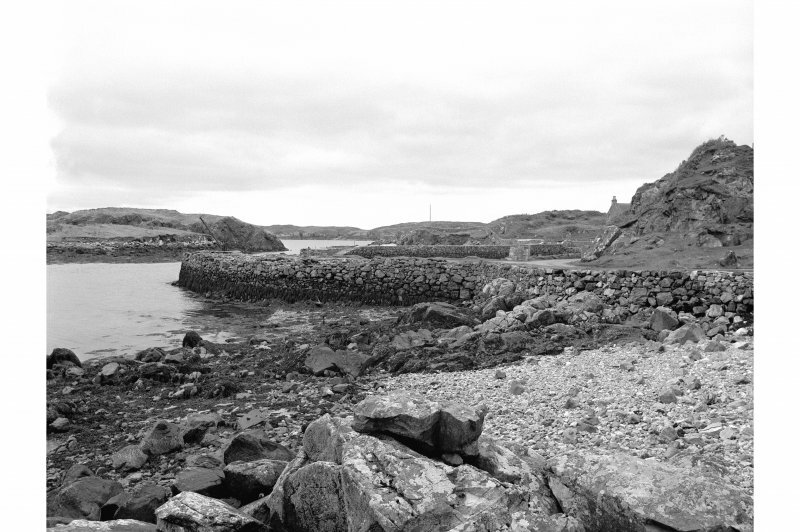 View of entrance to Rodel Harbour, Harris, from north-north-east. 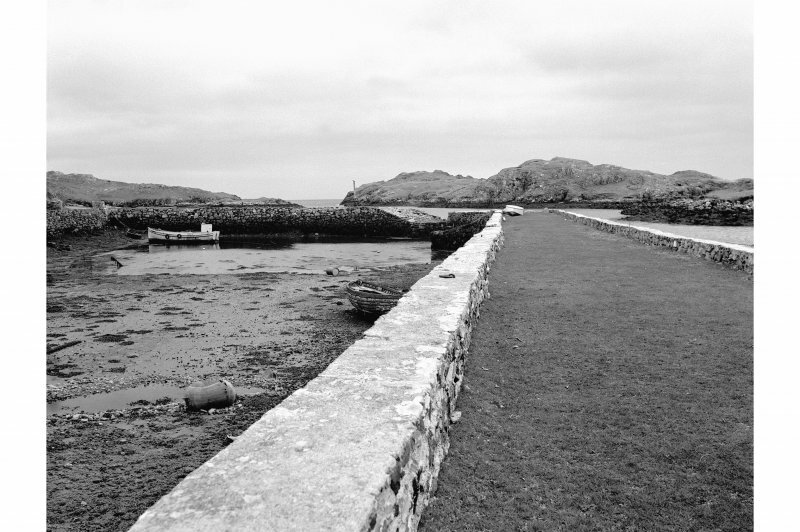 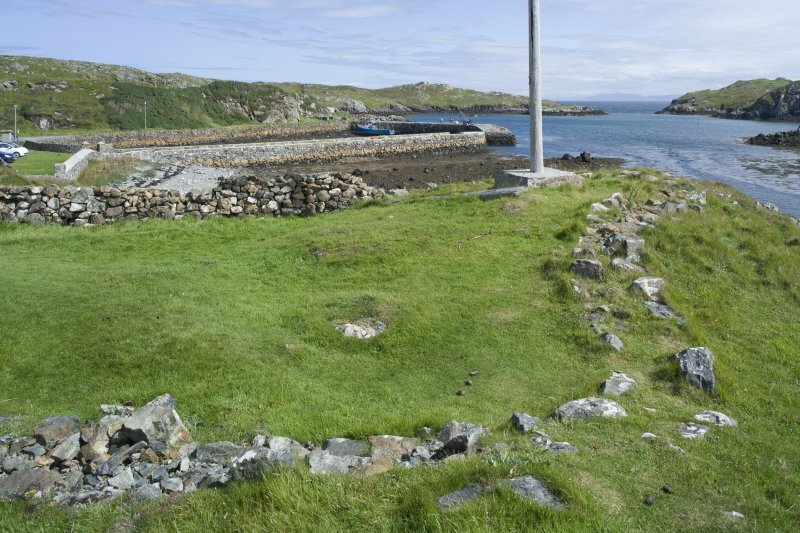 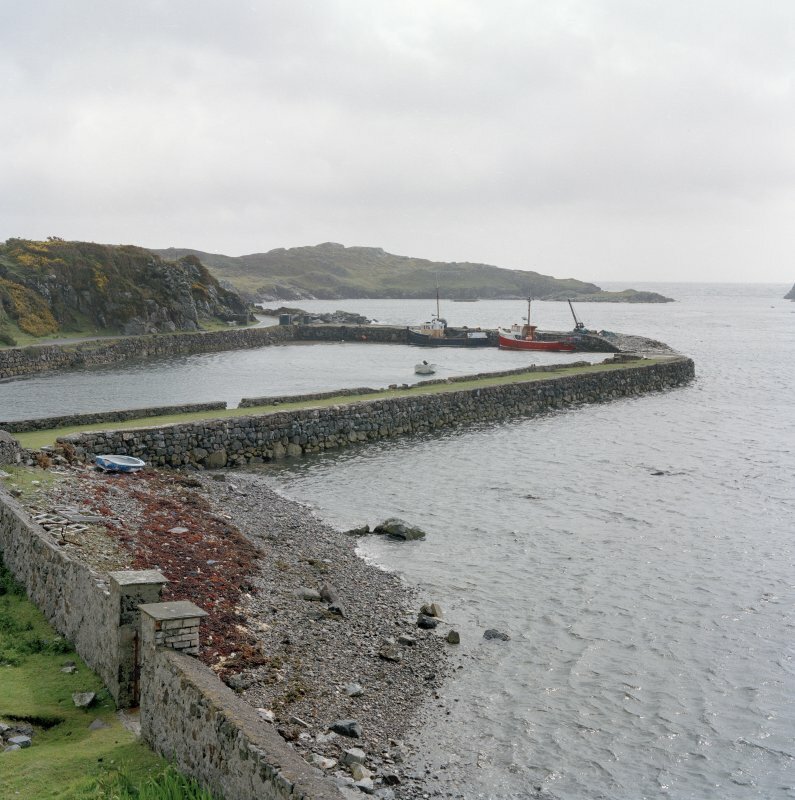 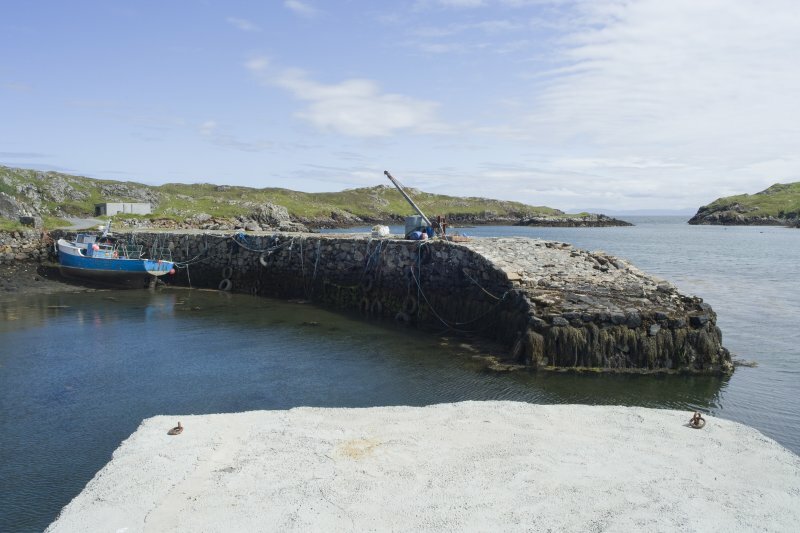 View of east wall at Rodel Harbour, Harris, from north-west. 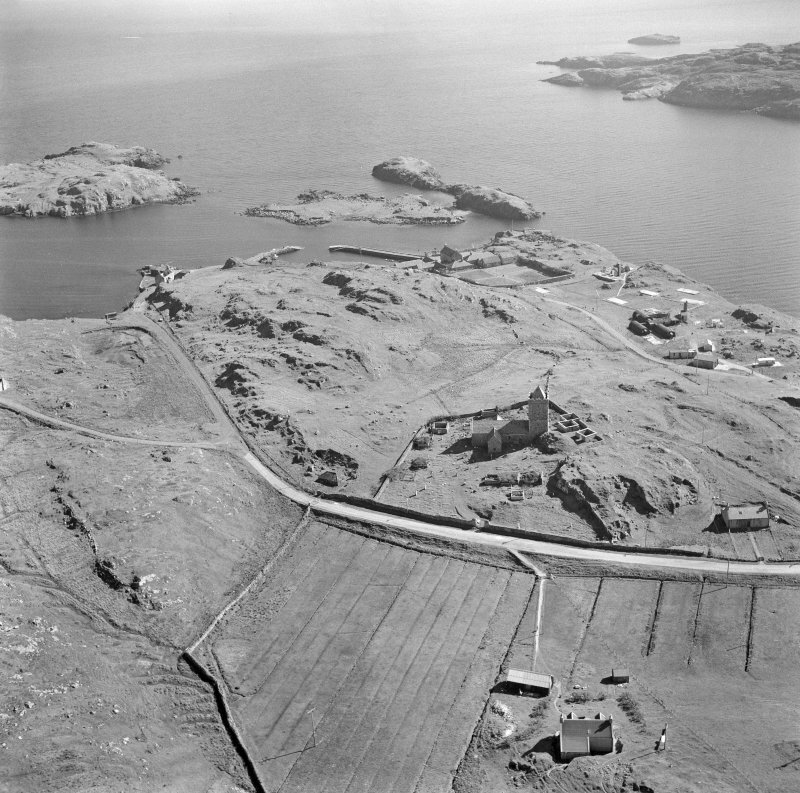 Oblique aerial view centred on the church and burial ground with the hotel and remains of the military camp adjacent, taken from the NE. 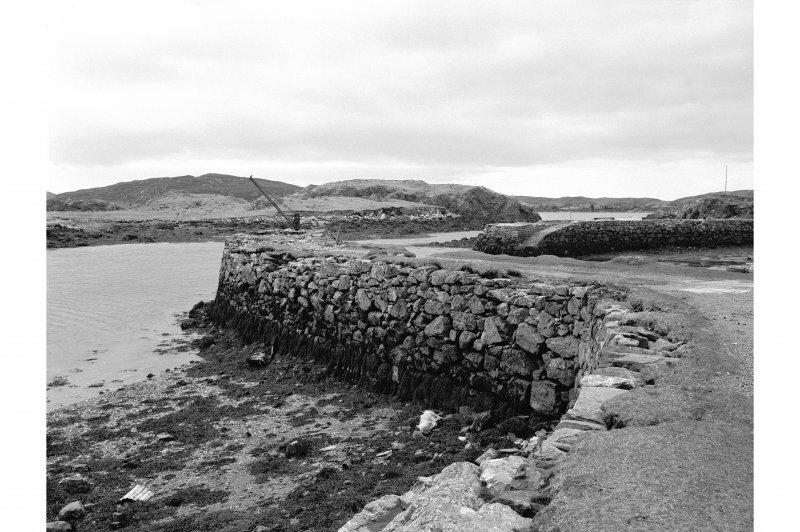 View of entrance to Rodel Harbour, Harris, from west. 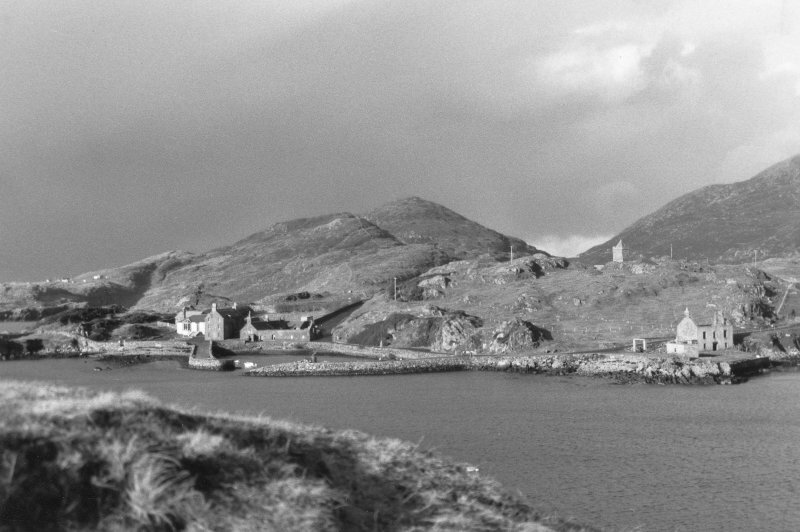 Distant view of Rodel Harbour, Harris, from west-south-west. 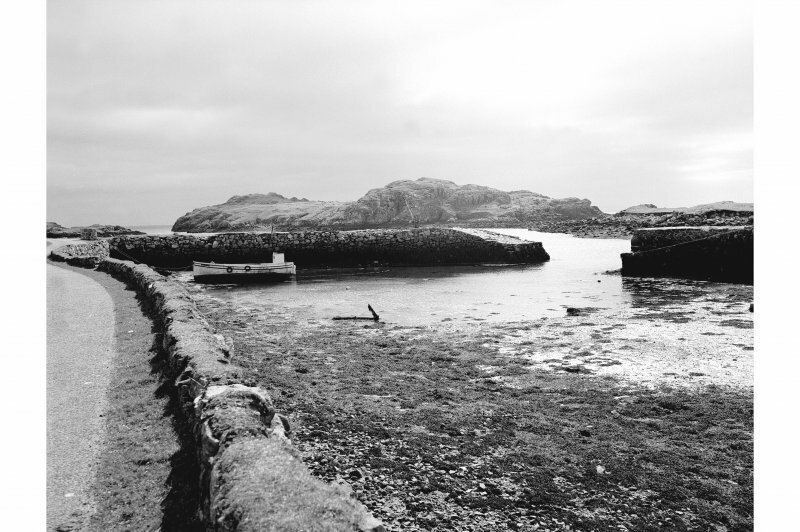 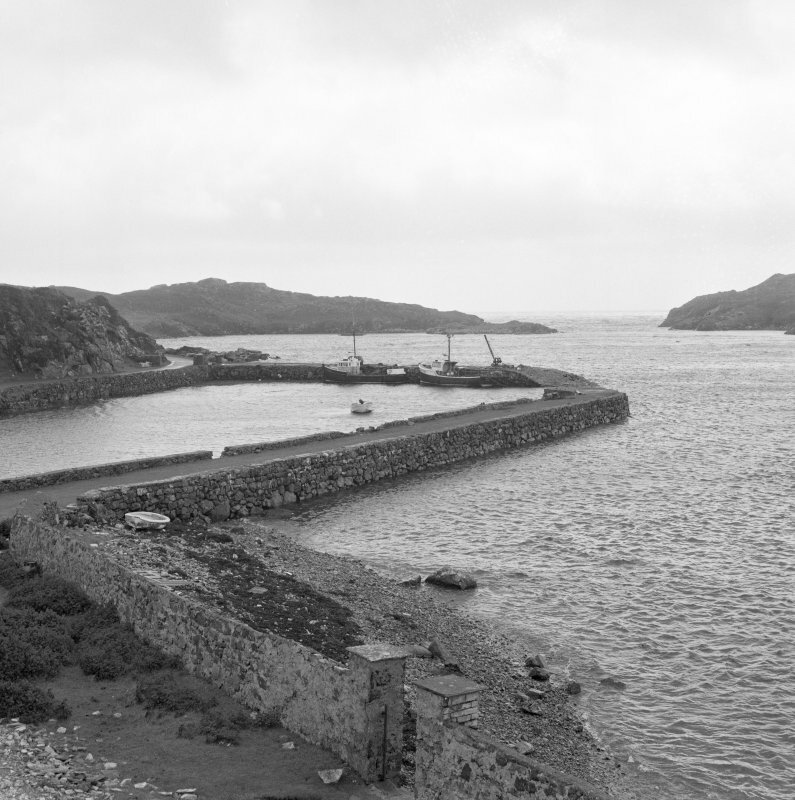 View of entrance to Rodel Harbour, Harris, from west-north-west. 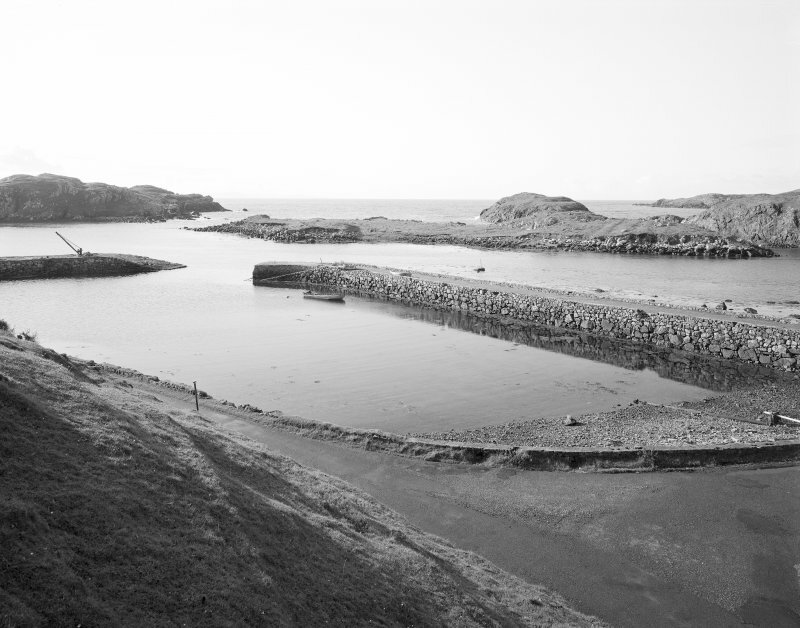 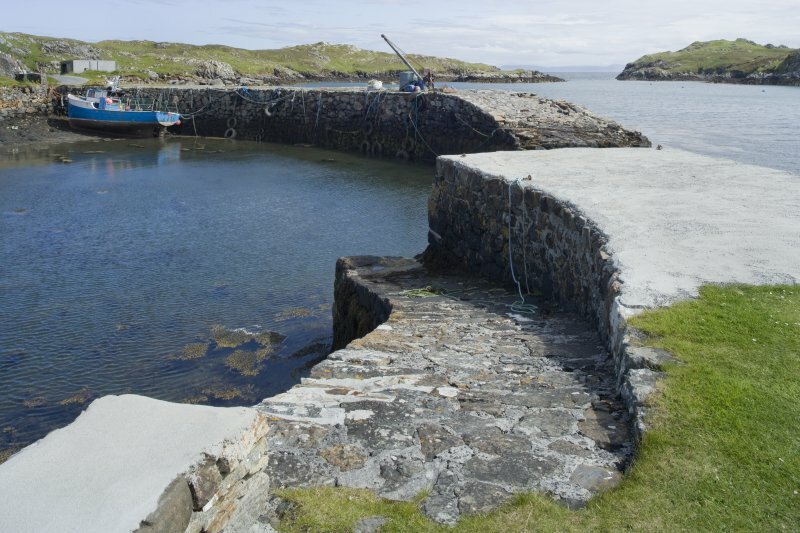 Rodel harbour, c.1785 Preceding Tarbert as the island's principal settlement and landing place, this compact dock with associated buildings was built at a period of relative prosperity in Harris, when Rodel became the centre of an energetic fishing and kelping enterprise. 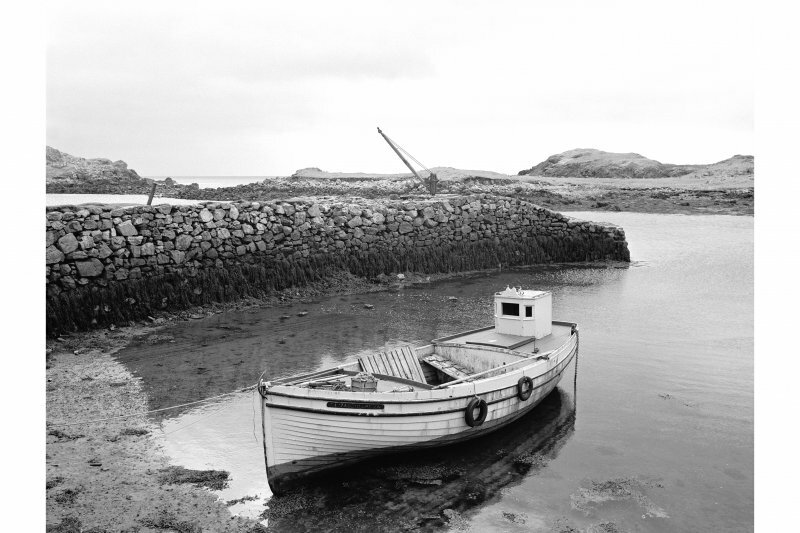 It was the legacy of Capt. 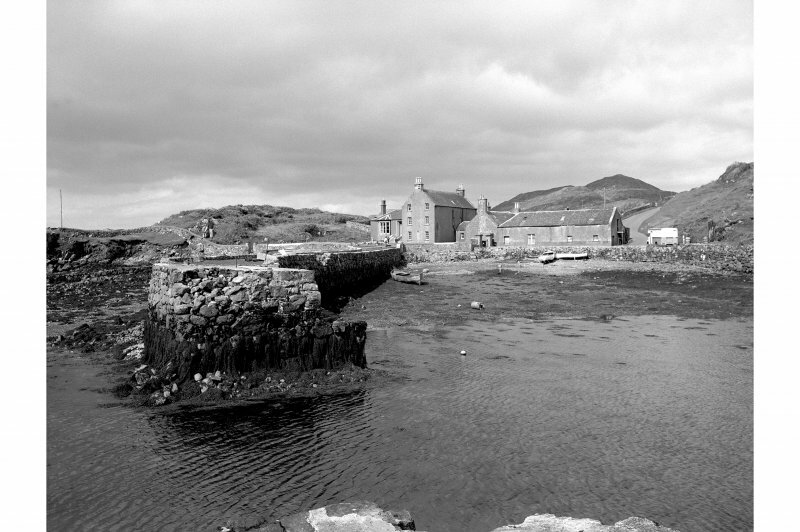 Alexander Macleod of Berneray (1716-1790), the model laird who bought Harris in 1779. 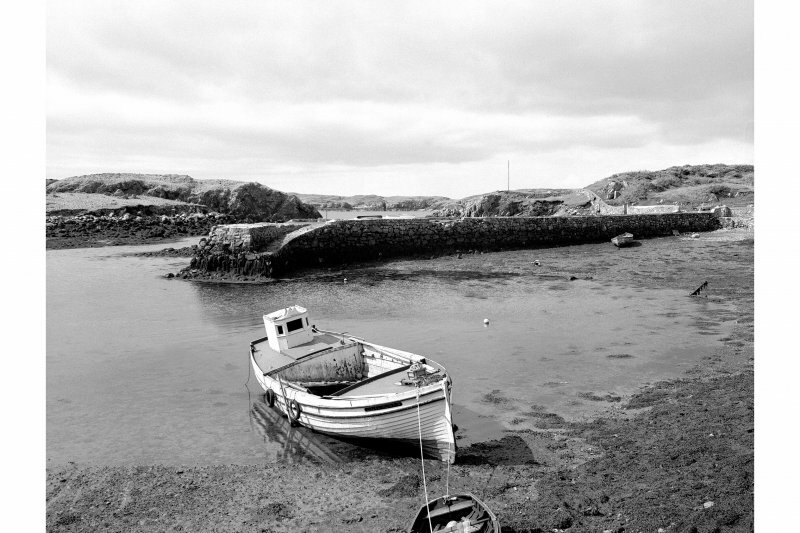 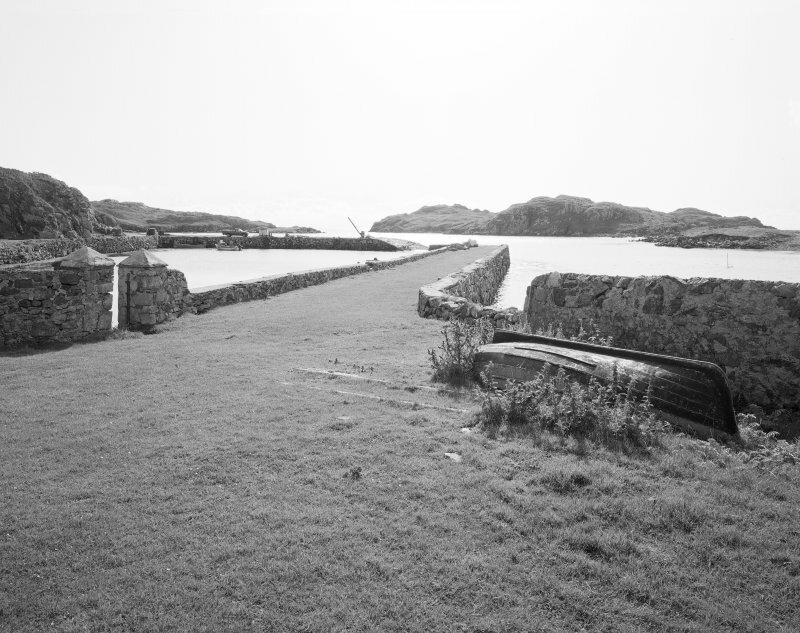 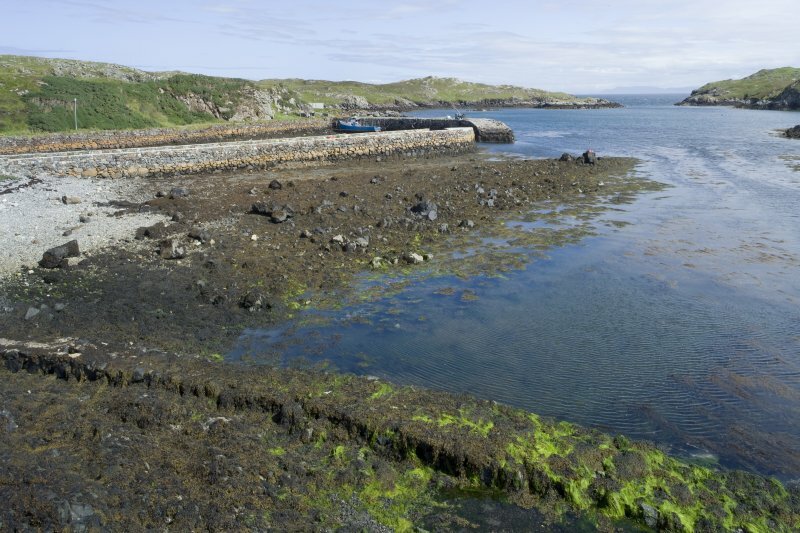 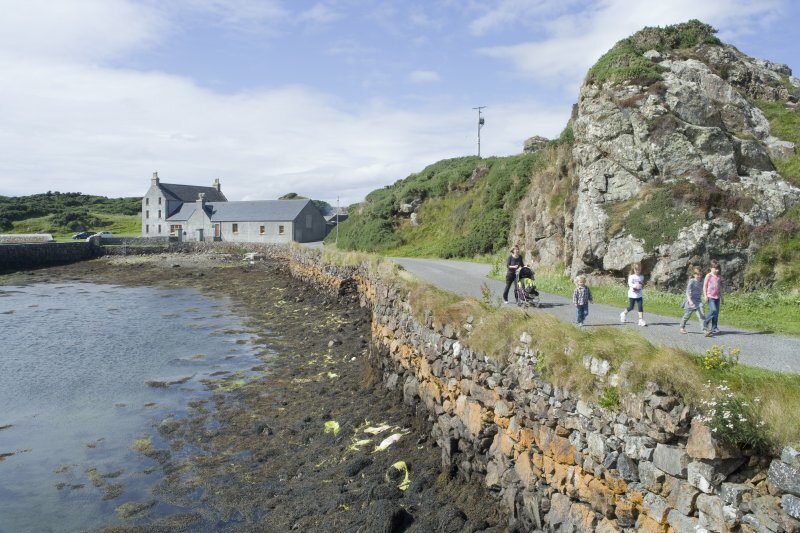 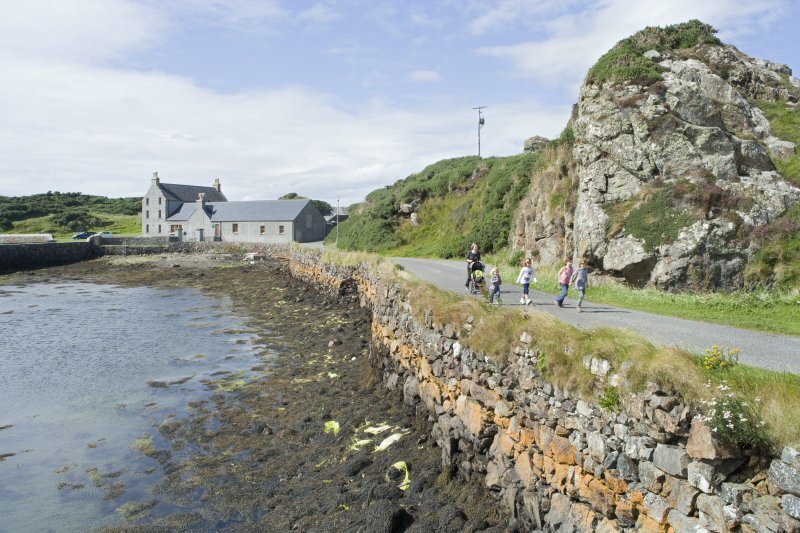 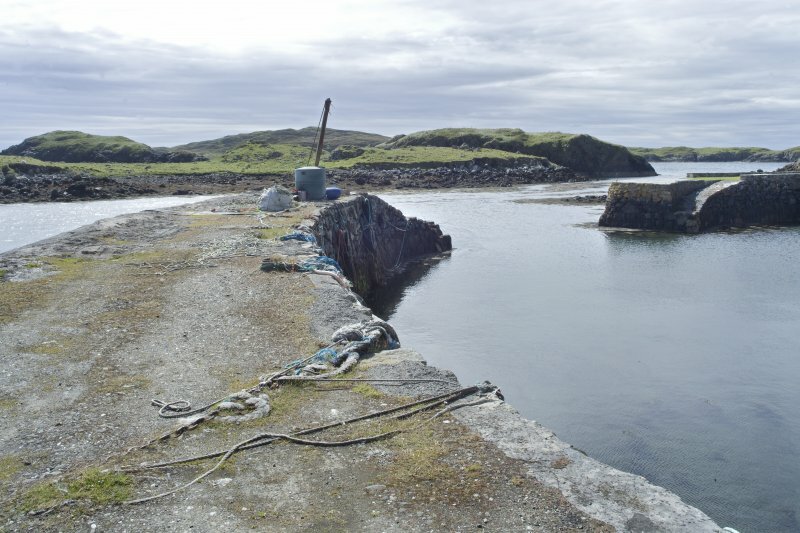 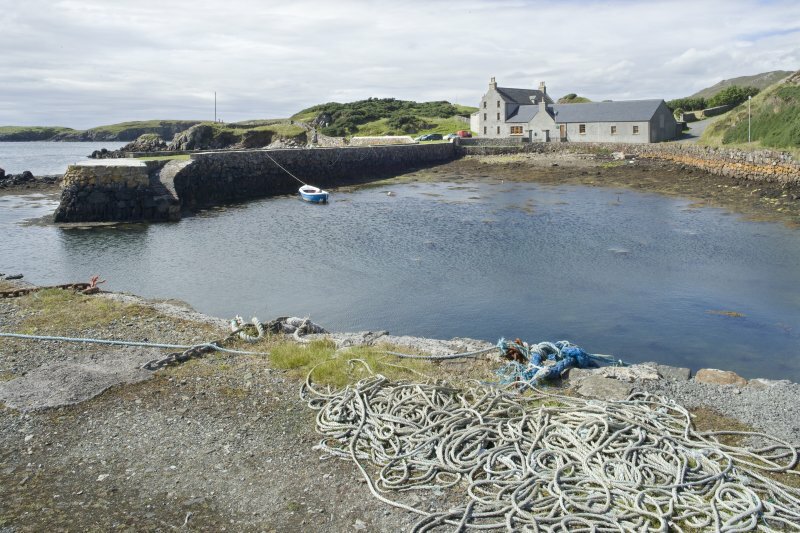 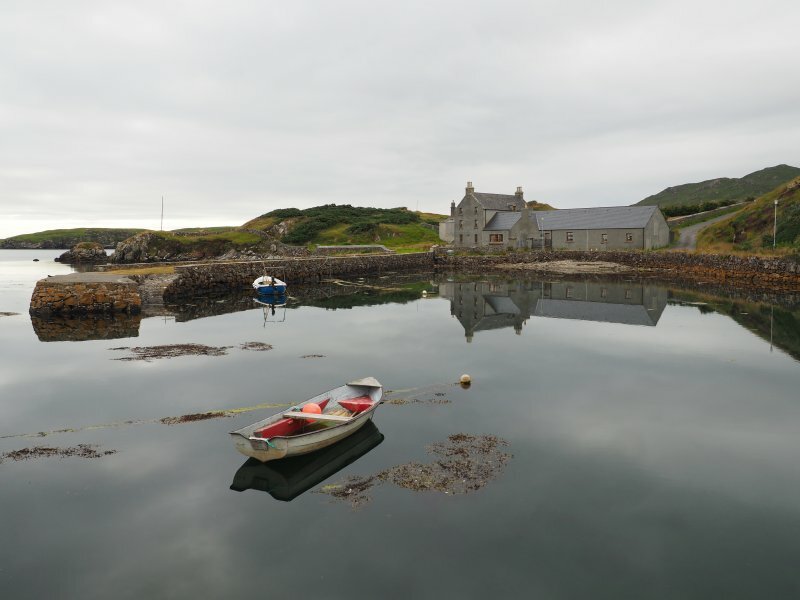 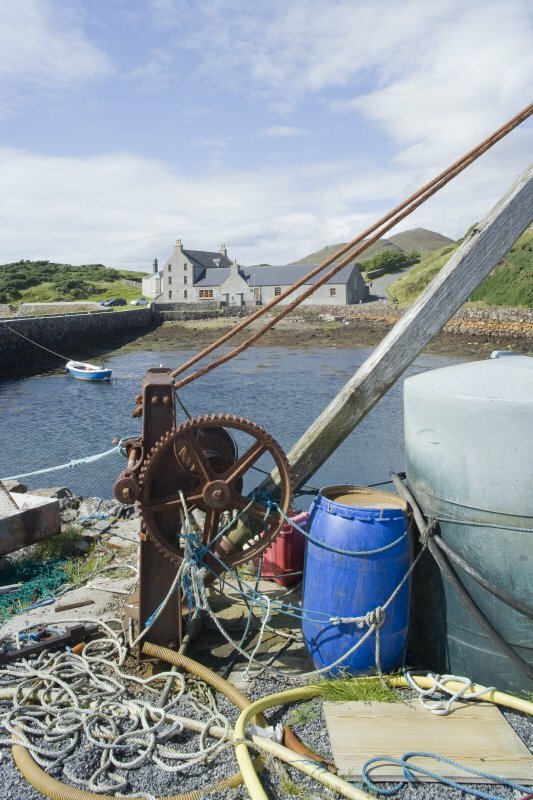 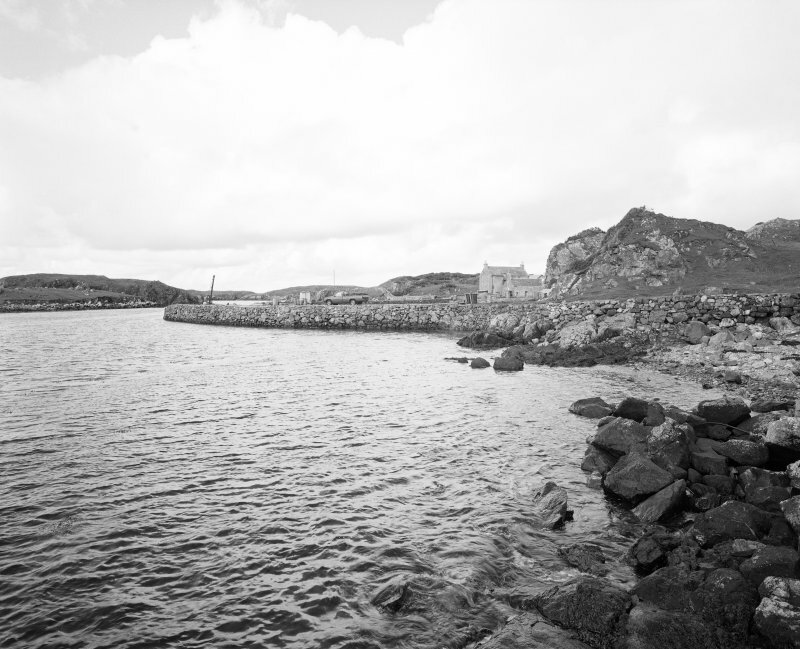 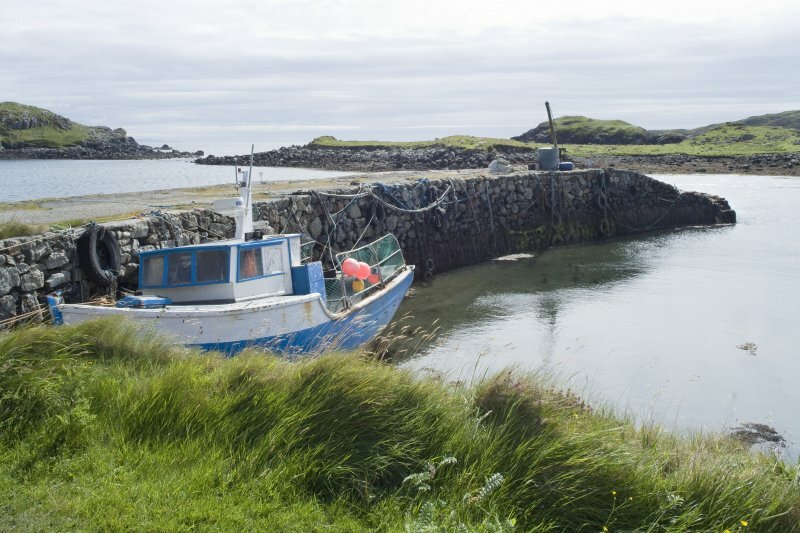 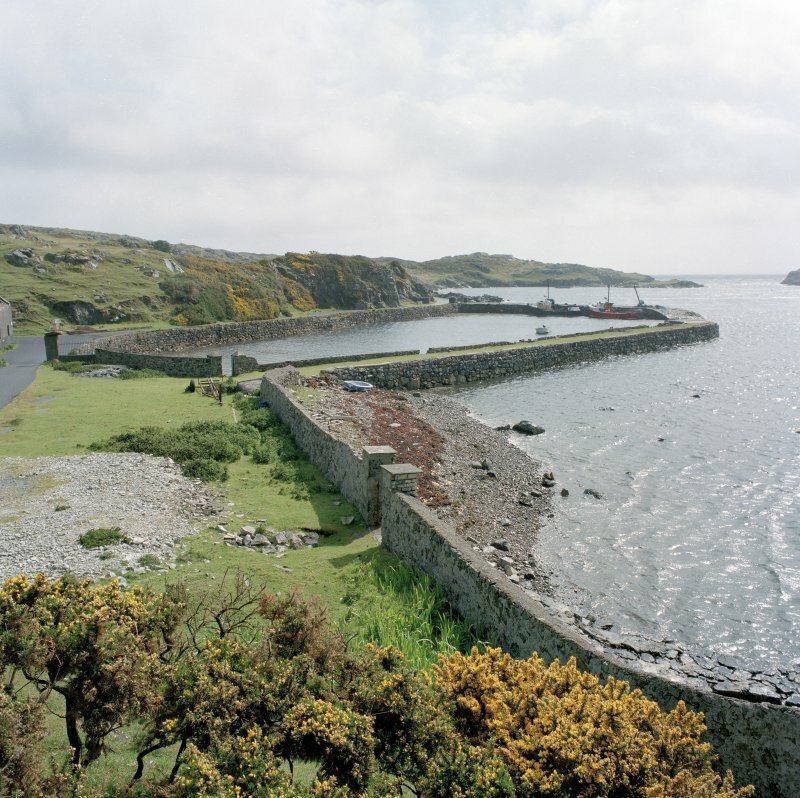 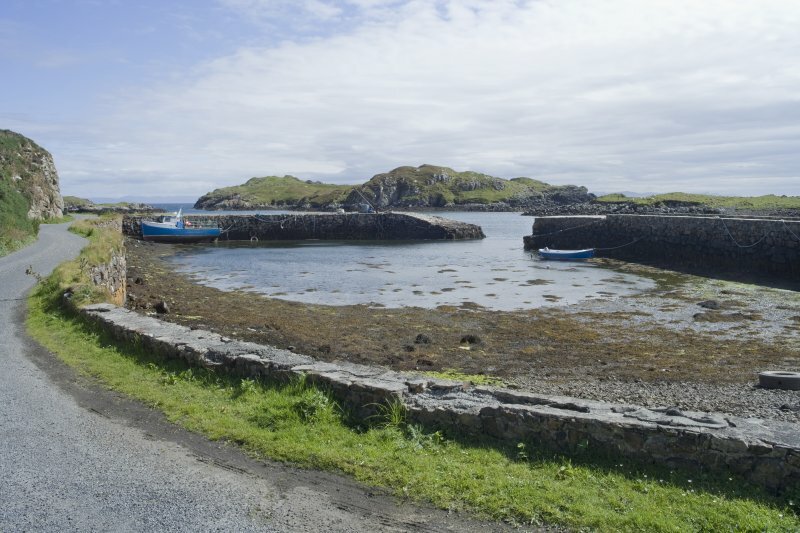 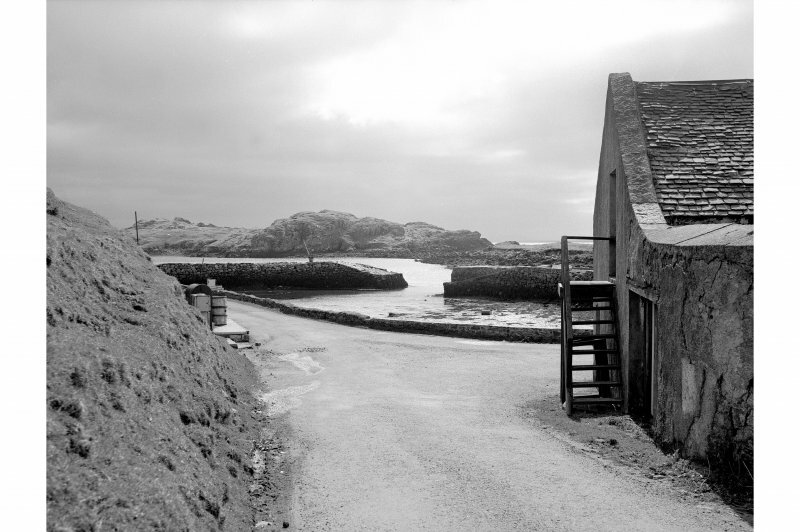 A recognised landing place from an early date, with a change house by c.1750, Rodel was now provided with stone quays and an 'excellent graving bank'. 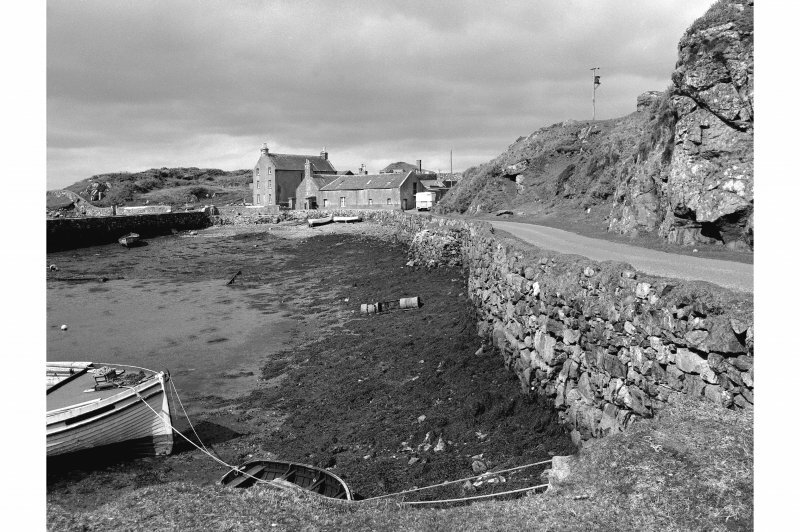 Macleod set about deep sea fishing, building a 60' boathouse and other structures, including "a store-house for salt, casks, meal etc.... a manufacturing house for spinning woollen and linen thread, and twine for herring nets ... a school-house and public house ...corn and fulling mill operated by water wheel... St. Clement's was repaired, plantings and cart tracks introduced, and shoemakers, weavers, turners, wrights and masons encouraged. 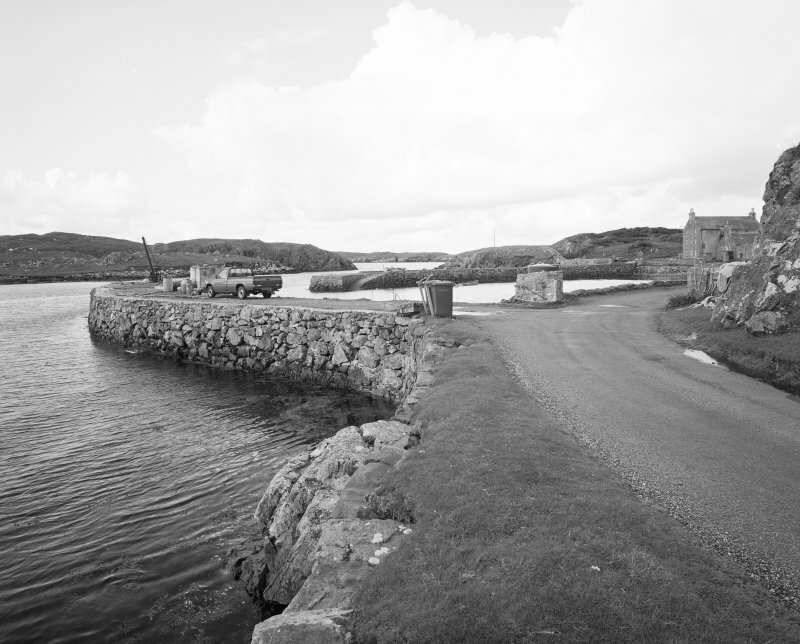 Several structures survive, but the scene at the end of the 20th century was one of needless dereliction and wasted potential. 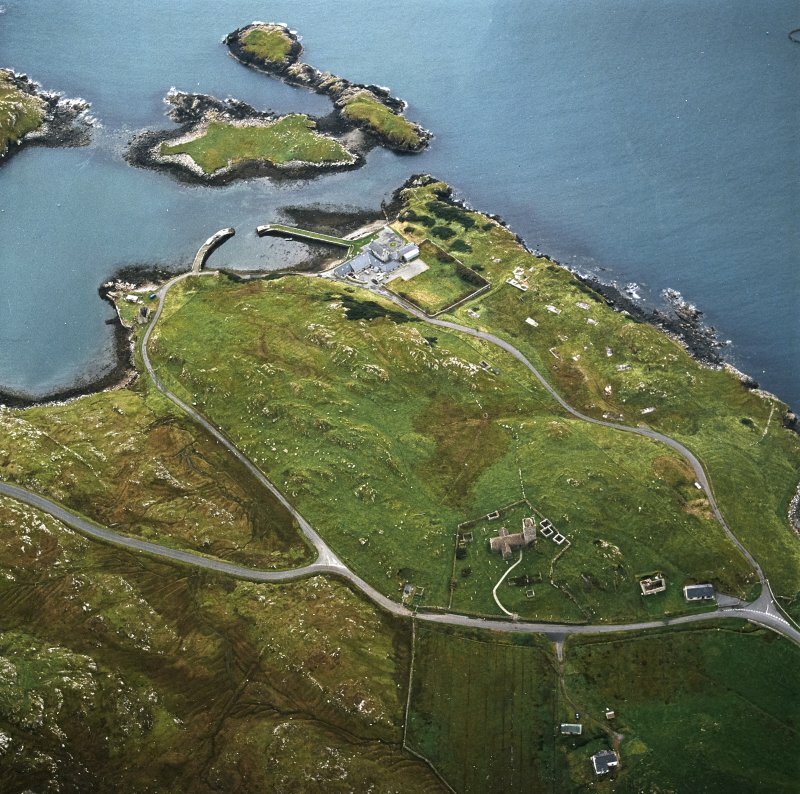 (Location cited as NG 047 827). 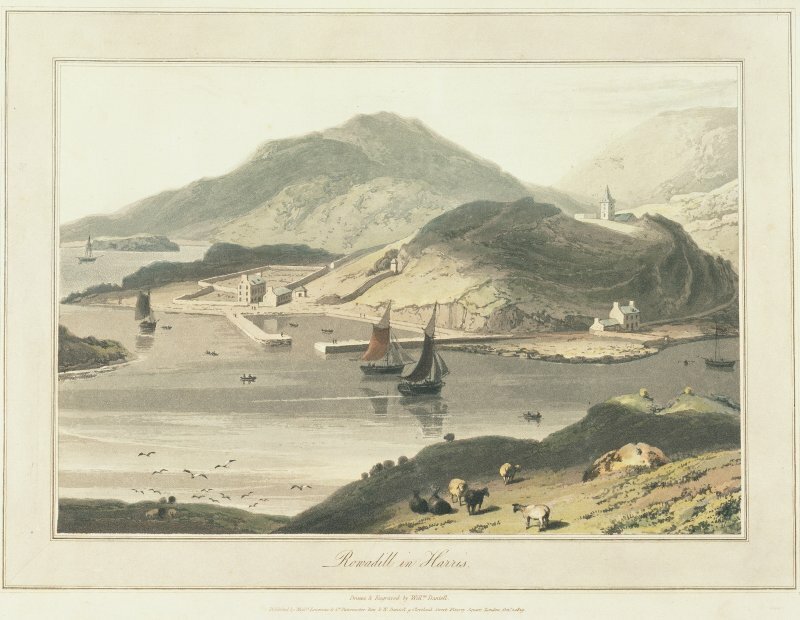 Harbour, Rodel, c. 1840 and later. 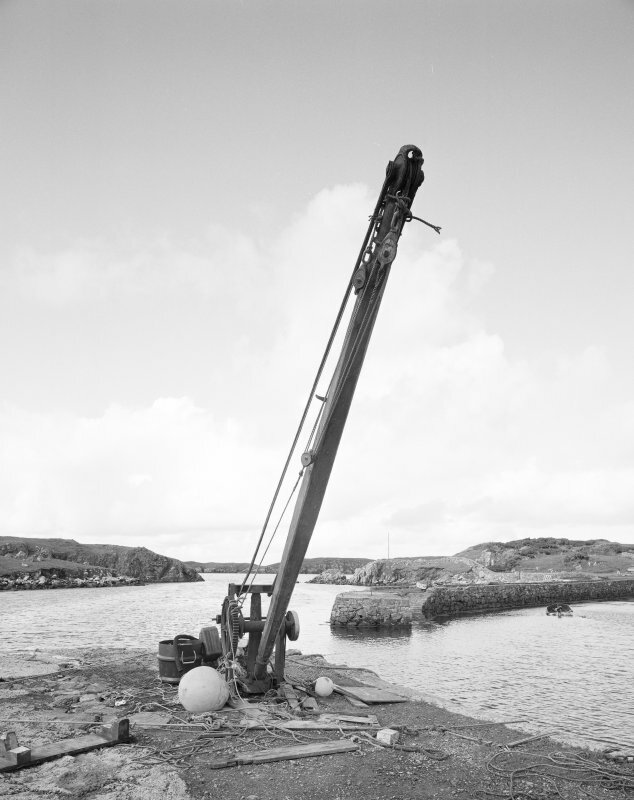 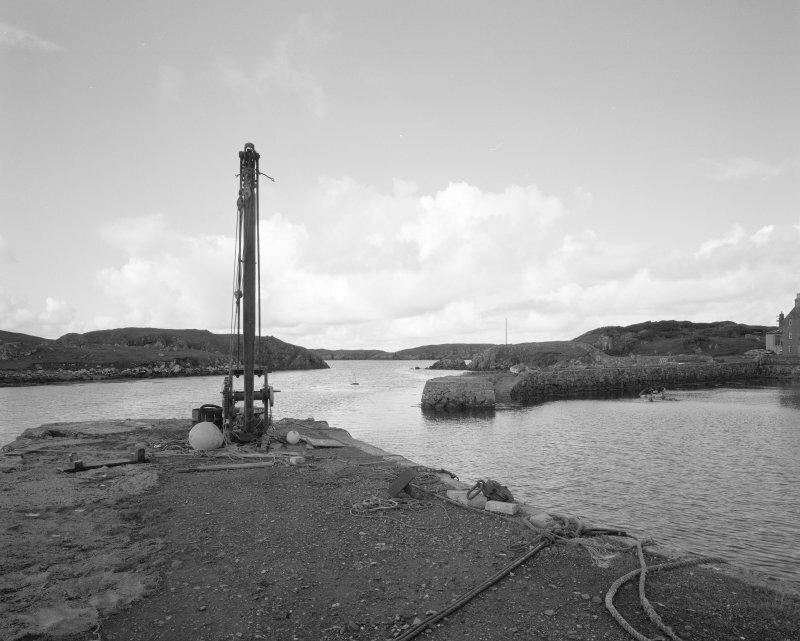 A simple basin formed by two rubble piers, one of them straight with an angled head, and the other curved with a wood-jib post crane (NG08SW 8.01) at its head. 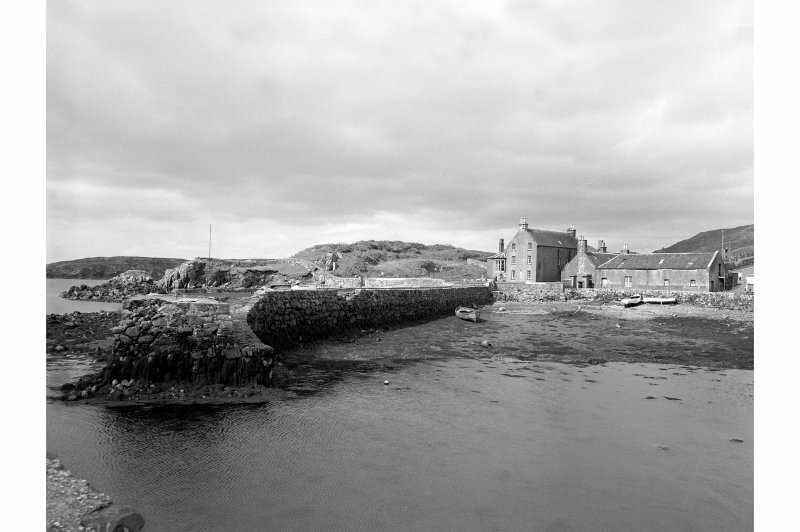 This harbour dates from about 1840 and later. 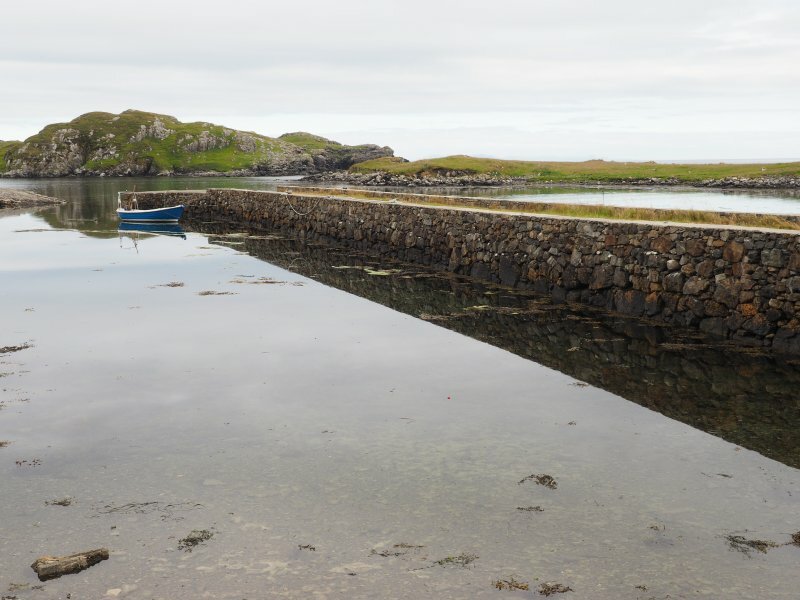 The basin is formed by two rubble piers, one of which is straight with an angled head; the other is curved. 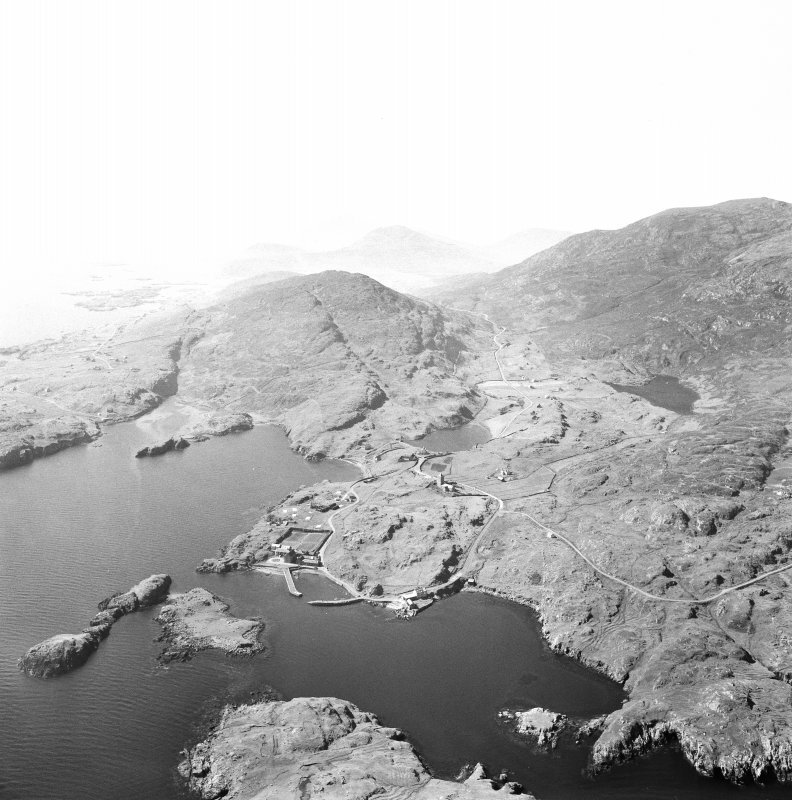 Oblique aerial photographs of St Clements Church, Rodel, Harris, and the surrounding area, photographed by John Dewar in 1966.